For five years Nā Maka o ka ‘Āina captured on video the seasonal moods of Mauna Kea's unique 14,000-foot summit environment, the richly varied ecosystems that extend from sea level to alpine zone, the legends and stories that reveal the mountain's geologic and cultural history, and the political turbulence surrounding efforts to protect the most significant temple in the islands, the mountain itself. 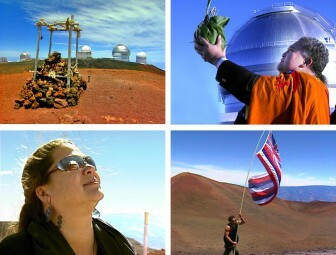 Mauna Kea - Temple Under Siege paints a portrait of a mountain that has become a symbol of the Hawaiian struggle for physical, cultural and political survival. The program explores conflicting forces as they play themselves out in a contemporary island society where cultures collide daily. In an effort to find commonalities among indigenous people elsewhere regarding sacred mountains, the documentary visits Apache elders of Arizona who face the reality of telescope development on their revered mountain, Dzil Nchaa Si An, known as Mt. Graham. Partially funded by Pacific Islanders in Communications, Native American Public Telecommunications, and Deviants from the Norm. Aka Mahi, Pualani Kanahele, Kealoha Pisciotta, Paul Neves, Manu Meyer, Keawe Vredenburg, Sam Gon III, Julie Leialoha, Kahu o Terangi, Kapono Souza, Clarence Kukauakahi Ching, Debbie Ward and Nelson Ho. PBS stations throughout the U.S.
National Museum of the American Indian • NYC, Washington, D.C.
Smithsonian Institute • Washington, D.C.